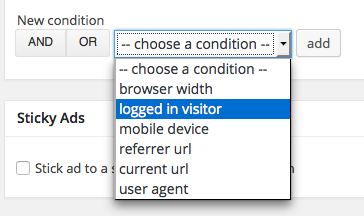 With the logged-in visitor condition you can define whether an ad is visible to logged-in visitors or not. You don’t have to use this condition if you want to display the ad to all visitors. To display an ad to logged-in visitors only or to hide it from them go to the Visitor conditions metabox and select the logged-in visitor condition. Now, choose the correct statement.